I can see my house in this pic. As you might know, I've been living on St Thomas since January. For the most part I haven't said much about it—I suppose I've had other things on my mind. Well, today we're going to examine one of the most interesting things about this island. No, not the beaches. No, not the resorts. No, not the plant and animal life. No, not the deep scars of colonialism. Something much more fundamental. St Thomas exists within a temporal anomaly I call the Tropical Time Envelope. Due to the locality and obscurity of the phenomenon, it has not been the subject of much research. Nobody can say for certain what mechanisms are responsible for the distortion field's existence, nor do we know whether the island is responsible for it or merely subject to it. Its influence upon island life, however, is plainly observable. In the interest of science, I have cataloged some of the Tropical Time Envelope's most salient effects, and submit them for investigation by parties with more experience in these matters. One especially visible impact of the Tropical Time Envelope can be stated as follows: for every year you spend on St Thomas, the rest of your body ages two years, while the development of your brain actually regresses one year. Popular knowledge lays the responsibility for this at more mundane causes: prolonged daily exposure to the tropical sun, the dearth of culture and lack of intellectual stimulation, the binge drinking compelled by the former, and the $2 packs of Marlboros one is always smoking because one is always drinking. (On St Thomas, the statement "I only smoke when I drink" actually says "I am a heavy smoker.") There is one flaw in this narrative: this effect of the St Thomas lifestyle is observed only in those who move here from the mainland or abroad. The local West Indian population is completely unaffected—having been born and raised within the Tropical Time Envelope, they possess bodies acclimated to it, and therefore undergo a normal aging process. Inside the Tropical Time Envelope are numerous regional distortions, and most of them appear to surround contractors and repairman. Say you make an appointment with someone to come over the next day and fix your toilet, fill your cistern, or take a look at your gas line. "I'll be there tomorrow," he'll tell you. Someone who is unfamiliar with how things work on the island will spend the next day (likely his or her day off from work) sitting at home and waiting for the repairman to arrive, which he most certainly will not do. Because of the temporal snare the repairman inhabits, your tomorrow afternoon is his next Wednesday or Thursday. It is useless to start an argument with him about his blowing off the appointment; from his frame of reference, he arrived precisely when he said he would, and you're the jerk. In the meantime, trying to call his cell and work out a rescheduling of his visit will avail you nothing. Between your phone, the cell tower, and the intended party, your call will pass through a veritable temporal-spatial waterslide that spits it out in another dimension entirely. Here's the kicker: for some bizarre reason, this does not apply to the repairman's calls to you. The accomplished physicist might see the potential for a total revision of every theoretical model touching on time and space in the unraveling of this mystery. But for the layman with a broken refrigerator, it just means having to subside on peanut butter sandwiches and canned corn until the repairman calls to say he's on his way (meaning his arrival is to be expected in two days). There might be some congruence of cause between the behavior of cell phone calls and mail delivery on St Thomas. It is not at all uncommon for Christmas cards from the mainland to arrive between February and May, or for Amazon packages to be delivered to your mailbox in an adjacent timeline. Time and space are aspects of a unified continuum, and so distances on St Thomas are also warped. Nowhere are the influences of the Tropical Time Envelope upon spatial durations more prominent than in automobiles. It is commonly believed that the poorly maintained roads, the saline atmosphere, and steep gradients (up to or over 37 degrees in some cases) are responsible for the heavy wear and tear on local cars and trucks, but these factors simply cannot account for the preternatural speed with which a brand new car deteriorates to chop shop fodder on St Thomas. The fact is that one on-island odometer mile is equivalent to something between ten and twenty mainland miles. The odometer will not actually reflect this; having been manufactured outside the Tropical Time Envelope, it cannot accurately measure distances within it. Recent studies in the field of Marxist physics have proved that the aphorism "time is money" is actually a popular conception of a fundamental physical law, which can be written as t = m (where t represents money and m represents time). Therefore, it follows that warped time should be concomitant with warped prices, and St Thomas bears this out fully. There is no other explanation as to why one would sanguinely assent to paying $14 for a deli turkey sandwich or $8 for a bag of Planter's peanuts as we do on St Thomas. The weak atomic force and electromagnetism were once believed to be two distinct forces among the essential natural interactions. In the 1980s, it was demonstrated that they are actually two aspects of a singular principle called the electroweak force, and become indistinguishable from one another under extreme conditions. Similarly, under the temporal pressures of the Tropical Time Envelope, yesterday, today, and tomorrow collapse into a single unified entity. That eternity and the moment are in fact identical carries tremendous philosophical implications—but philosophy does not thrive on St Thomas. Where everyday island life is concerned, the import of this is that putting anything off until tomorrow is really just as good as doing it today, and if you didn't do it yesterday, you're not going to do it today. 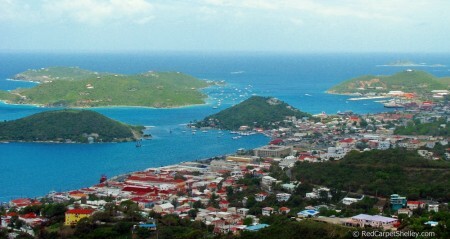 A corollary of this compressed time involves the duration of one's residence on St Thomas. If you've lived on the island for a week, you'll be living here for a month. If you've lived on the island for a month, you'll be living here for six months. If you've lived on the island for six months, you're never leaving. Fascinating. I wonder if the Internet is influenced by this phenomenon, and whether you posted this before you were on the island forever or after. I guess it depends on whether you had to wait for the Comcast repairperson at some point, who might be trapped in their van swollen shut with rust and a layer of nicotine film. Some of the spooky provisions for photons in the scheme of things also apply to the internet. No matter your position in the topography of space/time, you will become aware of the Taylor Swift/Nicki Minaj Twitter spat at precisely the same instant as everyone else. Corollary: Time flies when you're having fun.